TALLAHASSEE, Fla. – The Florida State women’s swimming and diving team enjoyed an all-around successful season in 2018-19. The Seminoles secured one of the best records in program history, showed improvement at the ACC and NCAA Championships in addition to excelling in the classroom and in the community. Florida State was represented by four individuals and two relays at NCAAs. Freshmen Ida Hulkko and Nina Kucheran along with juniors Ayla Bonniwell and Molly Carlson competed individually, while senior Leila Johnston, sophomore Emma Terebo, and freshmen Maddie McDonald and Kertu Alnek made the trip as relay swimmers. Hulkko became the first freshman in FSU history to compete in the individual ‘A’ swimming final at NCAAs, where she finished fifth in the 100 breast at 58.58. She joined Tiffany Manning (2002, platform) and Mary Montgomery (1975, 400 free) as the only Seminoles to earn an All-American status as a rookie. Kucheran qualified for her first NCAAs in the 100 breast and 200 breast. Carlson dove a full event list at the meet for the second time in her career and Bonniwell competed on 1-meter. This was their third-straight NCAA meet. The Seminoles jumped up two spots and finished in sixth place with a total of 727 points as a team after placing eighth in 2018. It was the most points scored at the meet since 2014. Carlson was awarded her second-career ACC Diving Meet MVP after she scored the most individual points (73) across three diving events. Carlson won her second-straight bronze on 3-meter (318.95), finished fourth on platform (231.70) and was ninth on 1-meter (259.50). The Toronto, Ontario, native returned to platform for the first time since the 2017 NCAA meet following a series of wrist injuries. Carlson became the second Seminole in history to capture multiple meet MVP honors in her career behind Chelsie Lerew (2001, 02, 03). Carlson, Kucheran and Hulkko earned All-ACC honors behind podium performances in three events. Kucheran won silver in the 200 breast where she set the school record at 2:08.78 after Hulkko grabbed bronze in the 100 breast at 58.94. The Seminoles also opened the meet with a bronze medal-winning performance in the 200 medley relay behind freshman McDonald, Hulkko, Johnston and Alnek in school record-timing at 1:36.28, which was an NCAA automatic standard. FSU had nine individual championship finalists. The Seminoles had nine swimmers and one diver making their ACC debut, all of whom contributed towards the team total. McKenna Keith returns to action for Senior Day. The Seminoles finished the regular season 11-1, 3-0 ACC, suffering its only loss to No. 10 Florida, while picking up key wins over No.13 Minnesota, No. 23 Alabama, Arizona State, Pitt, Georgia Tech, and Miami. It was the fifth time in school history of a one-loss record, tying second highest winning percentage (92) in program history. It was the first time since the 2012-13 season FSU put up a perfect October at 4-0. FSU secured two wins on the road over ranked teams, defeating No. 13 Minnesota 176-124 and No. 23 Alabama 159-141. Florida State was unbeaten in relays in head-to-head competition in 2018-19. Johnston led the team with 13 relay wins, followed by Terebo with nine and Alnek with eight. Among the 24 wins, six were over ranked teams. The divers contributed 13 wins out of 16 tries in meets other than invites. It was the second highest total in the conference behind Virginia. Hulkko was awarded ACC Swimmer of the week following the upset over No. 13 Minnesota. 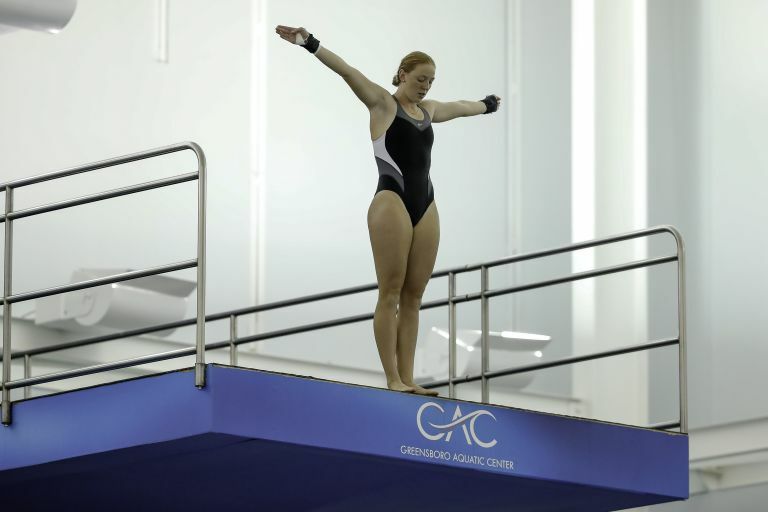 Carlson won Diver of the Week twice after her performances against GT/Pitt and against vs. the Golden Gophers. Alnek tallied 15 total victories this season, including seven individual. FSU tied for fourth place with No. 24 South Carolina at the GT Invite, ahead of all ACC teams competing including No. 19 North Carolina, Virginia Tech and Georgia Tech. FSU had a strong showing from its freshmen class this season, which consisted of seven international student-athletes. Among those seven, four made contributions at major international meets. Hulkko represented Finland at various meets since signing with the Seminoles, including the 2018 European Championships where she took fifth in the 50m breast in national record-timing at 30.53. Hulkko returned to Europe in November to compete at nationals where she took home two golds and a silver in the breaststroke events. Hulkko later finished in eighth place at the 2019 FINA Short Course World Championships in the same event. Another rookie, Kucheran represented Canada at two international junior meets while donning the Garnet and Gold. Kucheran won silver in the 100m breast (1:08.37) at the 2019 Junior Pan Pacific Championships before qualifying for finals of the 50m breast (32.06) at the 2019 Youth Olympics where she placed sixth. Following the NCAA season, Kucheran competed at the 2019 Canadian Trials where she was selected to represent her home nation at the 2019 World University Games in Napoli, Italy this summer. Prior to her arrival at FSU, freshman Kertu Alnek was busy at the 2018 European Championships, swimming in seven races. She returned home just before Christmas to win seven titles at the Estonian National Championships. Laura Jensen competed at the 2018 European Championships where she led off Denmark’s 800m free relay with a personal best of 2:00.27 in order to place seventh overall. The women’s team earned their sixth-straight CSCAA Scholar All-America status by having an GPA of 3.49, which tied for the highest GPA among teams representing public institutions in Florida. Junior Manuella Andrade was selected to the senior class council and served this season as the ACC SAAC representative for FSU. Senior McKenna Keith returned to the pool for the first time since the summer of 2018 for her senior day vs. FAU. Keith had been diagnosed with Hodgkin’s lymphoma while training in Germany and battled to return to help the Noles win the 200 free relay. Women’s swimming was awarded the Director’s Cup for Service for the second time in the past three years. The team also captured the Comprehensive Award at the Golden Nole Awards. The individual Golden Nole winners are presented to the student-athletes on each team who have portrayed the ideals of intercollegiate athletics. Head Coaches selected these Seminoles by evaluating athletic and academic success as well as their contribution to service to the university and community. 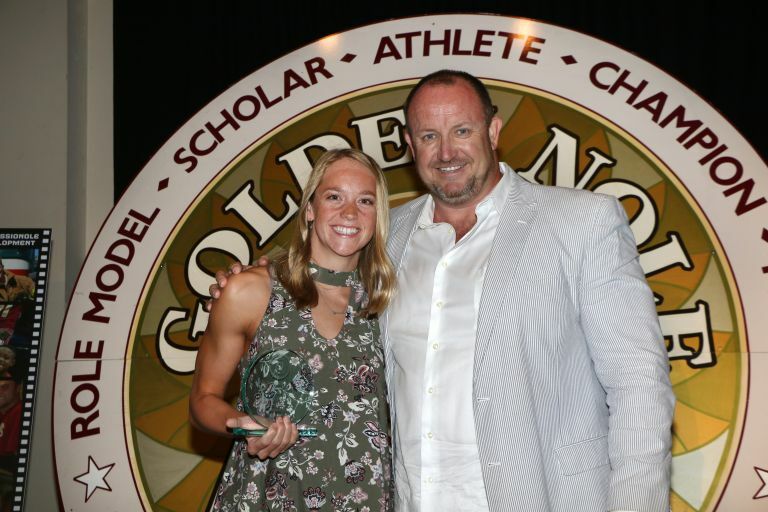 Senior Natalie Purnell was selected as the Golden Nole Award winner for 2018-19 for swimming and Carlson was chosen for the divers. 25 performances made it into the FSU all-time top 10 list. Purnell and Johnston served the season as the team captains. Schendelaar-Kemp and junior Eden Hessinger won the Femina Perfecta in the fall. The Seminoles were recognized in four of the six CSCAA polls this season, receiving the highest rank on Oct. 24 at No. 21.